Performance - Using methanol as fuel provides the energy required for the extended battery life. The energy density of methanol fuel is up to 30 times that of the best rechargeable batteries available today, but at lower power densities. The chemical hydride's energy density could be roughly 20 times the best rechargeable batteries, but have the advantage of higher power density of 10-100 times those obtained when using methanol. They could match or exceed batteries in power per unit mass. Cost - Our devices are made using the same materials and miniaturization technologies that are extensively used in the semiconductor industry to manufacture inexpensive silicon chips. These designs and methods of manufacturing ultimately will lead to the lowest cost production of fuel cells. We have made a priority of integrating the technology into product designs that are easy to use and adapt to the products already used by consumers. Some concept designs are shown in the last page of this document. We have also built working prototypes in our laboratories. 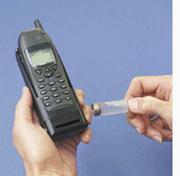 11/4/98 - First MicroFuel Cell powered cellular telephone calls using a Nokia 6190 cellular telephone. Demonstrated a direct alcohol fuel cell that can provide 120% of the power for a cellular telephone continuously in standby mode with a battery voltage buffer. 7/31/99 - Built a system prototype that provided at least 120% of standby power within case of similar dimensions to existing cellular phone battery packs. Enabled the cellular phone to make at least 15 minutes of calls within a 24 hour period. 2/3/00 - Test device achieved a specific energy output three times greater than standard lithium ion batteries currently used for cellular telephones (300Watt*hrs/kg). The current levels are 400 Watt*hr/kg with test cells running at ambient conditions on methanol fuel. 1/22/01 - Achieved 0.29 Watt output with a 16 cell array (19cm2) with a single substrate using hydrogen. 2/6/01 - Achieved 0.24 Watt output with a four cell array (29cm2) using a sodium borohydride flat pack. This is a new, safe hydrogen source that adapts to the MicroFuel Cell. From tests with ampoule cells we have achieved a 5.7% hydrogen yield by weight with chemical hydride ampoules. This translates to a theoretical system estimate of 940 Watt*hr/kg (0.6V/cell). 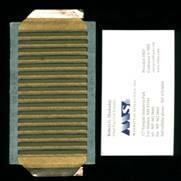 3/15/01 - Working Power Holster prototype tested over a six-month period. The main achievements were: ability to go from test to prototype device, running a cellular phone on standby for 69 hours over a two-week period with less than an ounce of methanol fuel, and no loss of peak power performance observed. 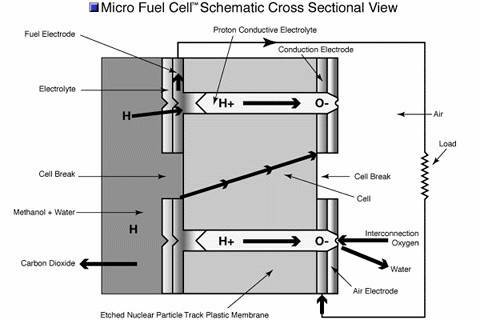 2/04/04 - Developing a wide temperature and fuel range (0-200°C) MicroFuel Cell for small applications. 9/13/04 - Continuous running endurance test exceeded 1000 days with four MicroFuel Cell test cells and diffusion delivered methanol ampoule. The milliwatt power output is running a flashing LED. The cumulative average delivered specific energy is 180Watt*hr/kg of fuel, matching the performance of the best commercial lithium ion batteries.